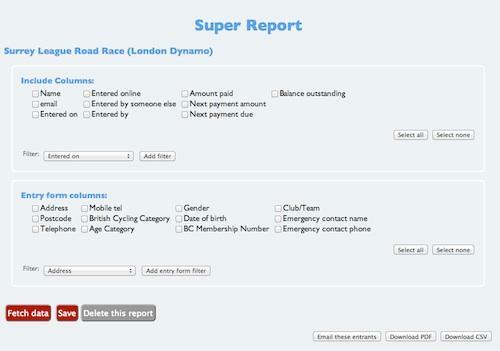 We called these reports 'super' because they go a lot further than traditional reports - they are very flexible and provide access to all you entrant data, including answers to any custom questions you've added to your entry form. 'Include Columns' shows the basic values common to all entrants that you can show in reports: Name, email, when they entered, whether they entered themselves, how much they paid and so on. Below, under 'Entry form columns' you can see all the questions that appear on your entry form, this includes everything you added. 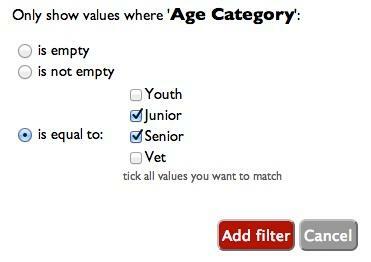 The power of this is that it's up to you what information you want to collect on your entry form, you can ask where they heard about your event, add price adjustments, ask about age or category preference, and filter these answers in your report. It's up to you how you use this, but you might want to regularly send out a 'thanks' email to all those who made a chartable donation (maybe event different emails according to the level of donation); or you might want to contact junior entrants to check that they will have a parental consent form on the day - or even just keep an eye on any payments owed. All reports can also be used as email distribution lists. 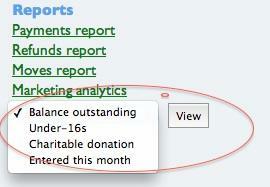 At any point you can click the 'Email these entrants' to generate an email to the entrants returned by the report. First, there's the standard 'email to all entrants' tick box (blue circle)- tick that and all entrants will be added to the recipient-list for this email. Use this for general emails (e.g. updates about course changes or on-the-day preparations). Second you can choose any of your saved reports and add all the entrants picked out by that report to the email recipients (purple circle). Use this for regular updates (e.g. contact everyone who made a donation). 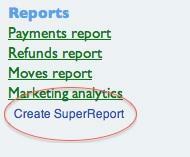 Finally, you can run an ad-hoc report adding all the entrants on it to the recipient list (green circle). So if you just need to send a quick communication to everyone that entered in the last week, or everyone in a particular team, that's how you do it.